Round here it's been so busy that apparently I have not been making time to blog. . . But this always happens in July, between the frenzy of getting ready for Renegade and the allure and distractions of summer "break" my days fill to bursting. Anywho, here's some snapshots from my last couple of weeks. . . Above, many Tangleweeds shots from fairs and orders shipped out. The second photo from the bottom shows some of my upcycled tin earrings, now available at Gorgeous and Green in Berkeley. 1. 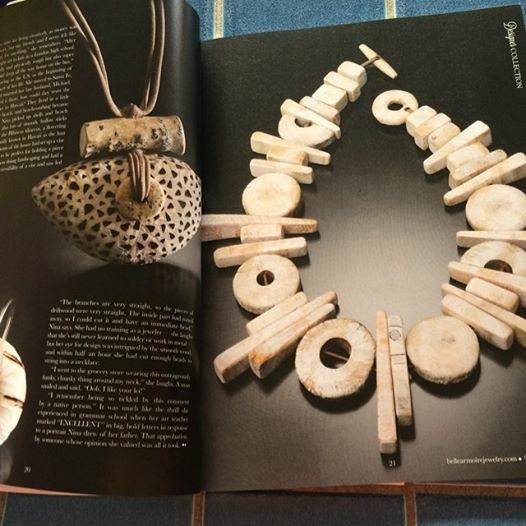 Relaxing with the summer issue of Belle Armoire Jewelry magazine and gleaning much inspiration from the story about the artist behind this lovely piece. 2. 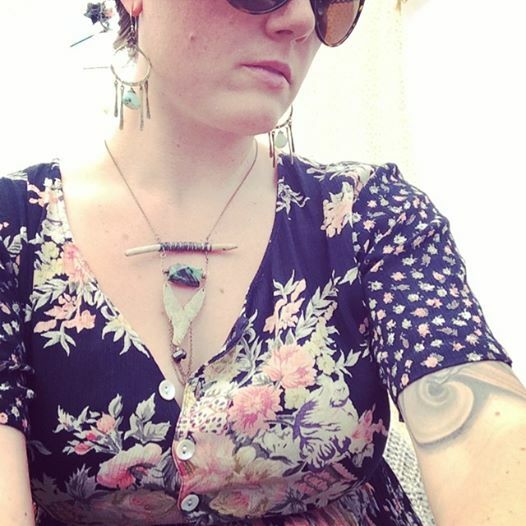 Wearing one of my OOAK pieces at a fair, enjoying it for myself before it finds a new home. 3. Relaxing at Stinson Beach with my nephew, Noah. He literally stayed in the water for 3 solid hours. No ocean is too cold for him! I also should mention one more thing: I know I was remiss in running a giveaway for the month of June. I think I'm going to hold off on anymore giveaways until August. So, if you're itching to see if you'll be the next lucky Tangleweeds winner, check back in August. In the meantime, I'm gonna be finishing the mini-men's collection I'll have available at Renegade, and prepping for the Temescal street fair this Sunday! Oh, and happy fourth to one and all!!! !